Bob Boze Bell's Big Bad Book of Bad Diary Entries: Check Out This Stagecoach: Matched White Horses or Mules? Check Out This Stagecoach: Matched White Horses or Mules? Got a debate going here at the True West World Headquarters. 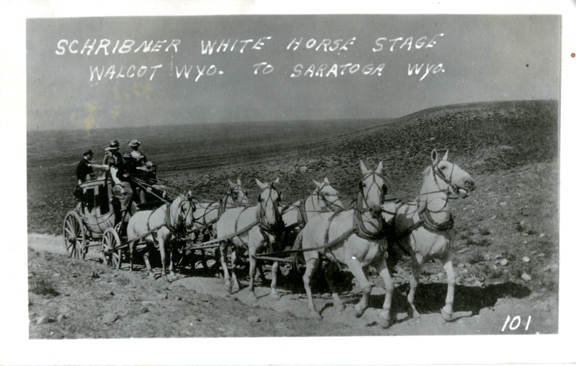 Found an old photo in our archives and the ID on the picture says it's a "White Horse Stage," but some of us think those are mules. What do you think? "Look like mules to me." —Deb Kidwell "The Jackass Lady"
"My first thought is Pissed off Horses. Reason one, I have never seen a mule with a Roman nose and the lead one on the left has a very good example of a Roman nose. Thats the front bone shape sort of arches out. Not to say it has never happened to a Mule but just what I see. Because the ears are pinned back they appear to be larger, and the builds are more of a draft cross so the ears would be a bit larger than the average horse. They have draft cross mules as well. When the Donkey is mated with the Grey Percheron the Mules would be that colored. I have a book that has huge Grey Horses pulling a fire pumper and they look just like these in your photo. I put $98.00 on HORSES! So keep me posted on who wins. Love the Photo." PS: "Seldom were Mules hitched to Coaches due to their unpredictable temperament!" "A very nice set of mules." "Yep, they're mules. Back in 1976 for a Bicentennial Event I spent a week on the Crook Military Road staring at my mule, Monte's ears. The son of a gun bucked me off up near Woods Canyon Lake. My dad loved mules. We had a couple of them when I was a kid. I didn't like 'em much as they were much smarter than me." "It may have been called the White Horse Stage but it's being pulled by mules. The longer ears for sure and the nose of a mule is often larger and less .. uh ...'delicate' than that of a horse. The nearside lead mule is a good example and if you study the others close they have the similar characteristic. Regardless, it is one impressive well matched six-up." "Cayuse hosses. Not a mule in the six up." 60+ years working with equines of all kinds says those are mules undoubtedly.